Sydney is the most well-known city in Australia and arguably the most vibrant. Flanked by the its bridge and the iconic Opera House, the harbour offers breathtaking views across the bay. You can take a ferry from Circular Quay to one of the nearby beaches, a speedboat or a more leisurely dinner cruise. Back on dry land, the city has something to suit the tastes of every traveller. For the gastronome, eastern and western styles of cooking are combined in Australia's signature "Fusion" cuisine. The zoo, botanical gardens and aquarium give a taste of the unique flora and fauna to be encountered when the city is left behind and enthusiasts of art and culture will not be disappointed with the selection of museums and galleries. 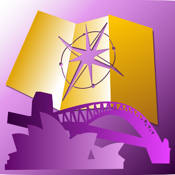 As you explore you'll want local maps on your iPhone but if you are visiting Australi from another country you could easily run up substantial roaming data charges. With this app, you will avoid them. 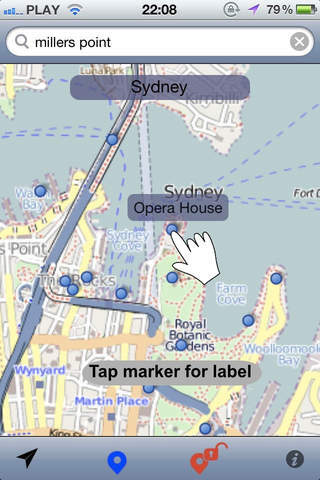 A map of Sydney is stored directly on your device. Personalised markers allow you to annotate the map according to your needs and when you have access to data (hotel wi-fi for example) you can use iOS location search and store the results for offline use. You needn't worry about separately downloading map data - it's all taken care of within the app and yet it manages to use only 14 MB of storage. Better still, it's free for basic use and a small extra charge allows you to see extra mapping detail and customise markers. The map data is sourced from OpenStreetMap. This is a freely editable map of the whole world and is more up-to-date and detailed than its competitors.